Every King needs his crown, and they don't get much bigger than this. 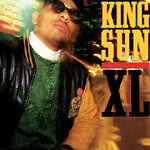 Originally released by Profile Records, King Sun's 1989 debut album XL introduced the world to the Bronx rapper's explosive style, a combination of smooth, party-rocking rhymes and intelligent lyrics inspired by the teachings of the Five Percent Nation. Emerging from an era of legends like Rakim and Big Daddy Kane, King Sun proved with songs like ''On the Club Tip'' and ''Hey Love'' that he could hold his own alongside the biggest names in hip-hop. Out of print for over 20 years, Traffic Entertainment Group, in partnership with Proile and Zakia Records, is proud to present the definitive version of King Sun's acclaimed first album, featuring audio remastered from the original analog tapes, deluxe packaging and two bonus tracks (''Mythological Rapper'' and ''Christmas in the City'') available for the first time ever on CD.